Probably from the very first episode of Dexter, it occurred to me that Dexter was not a true sociopath. I can’t confess to knowing the inner workings of a psychopathic killer’s brain, but I do know what I’ve learned and what I’ve read, and there are several aspects of Dexter’s personality, more pronounced as the series goes on (and we’re now on season 7,) that don’t exactly jive with the main tenants of sociopathology. In his 2004 text on serial murder, Peter Vronsky lists many of the primary characteristics of the sociopath/psychopath, (terms which are often used interchangeably,++ and which I will use interchangeably for the purposes of this article) as seen in Hares Manual for the Revised Psychopathy Checklist. Superficial charm, pathological lying, manipulative behavior, and poor behavioral controls are just a few of those characteristics. Another major earmark, perhaps the defining characteristic of a sociopath is the marked lack of empathy and respect for other people’s feelings and personal well-being. They are generally hedonistic, with little regard to the effects their pleasure-seeking has on others. The psychiatric term attached to this behavior is antisocial personality disorder, and while it may be said that not all sociopaths are serial murderers, nearly all serial murderers are sociopaths. (This does not account for killers who are suffering from a psychotic episode; psychopaths and psychotics are markedly different.) It may be said that sociopaths are “not operating by and recognized or accepted moral code,” (Vronsky, 245.) While Dexter has many of the characteristics of a sociopath, namely his ability to feign normal emotions, and to lie and manipulate his way out of most any situation, he seemed to me, from the get-go, far too introspective for the typical sociopath. Dexter: I’m empty. But I found a way to make it feel less … bottomless. Jeremy Downs: How? Dexter: Pretend. You pretend the feelings are there, for the world, for the people around you. Who knows? Maybe one day they will be. Dexter not only intellectually recognizes his lack of “normal feelings,” but seems to actually lament their absence and the need for him to essentially keep up a mask of who he thinks he should be. While a sociopath’s level of intelligence may vary, considering their general lack of regard for others, it seems unlikely that they would give much thought to how their own behavior is “different” or “unappealing” to society, except for the purpose of convenience (conforming enough to not get themselves in trouble.) Another major flaw I noted in Dexter’s pathology is his intense connection to his sister, Deb. The idea that I’ve gotten from all of my studies and reading is that true sociopaths generally lack either the ability or desire for any type of intimate interpersonal relationships (I use the word “intimate” in a platonic, non-sexual way.) Many sociopaths may have seem to have an “affinity” for a certain person. They may even claim to love them, but more likely as not, they are probably attached to an idea said person represents, or to some form of comfort/convenience said person gives them. However, in Dexter’s case, he seems to genuinely care for Deb. This becomes more evident as the series progresses through the seasons. Most recently in the season seven pilot, it is revealed through flashback that as a child Deb once fell in love with a puppy her mother allowed her to bring home, only to be brokenhearted when Harry inexplicably made them return the dog. In the flashback, a preteen Dexter goes to his sister, feeling sorry and lamenting the fact that he, himself, is the root source of his sister’s anguish; Harry made her and her mother return the dog out of a recognition of Dexter’s budding psychopathic tendencies and a fear that Dexter would end up killing the dog. 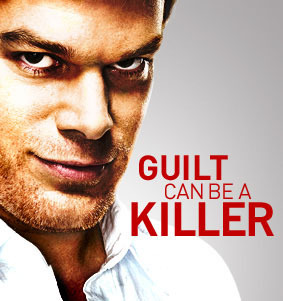 Similarly, despite the fact that Deb’s tenacity as a cop is a constant source of trouble for Dexter, he can not bring himself to kill her at the end of the first season, not even to make a connection with his newly discovered serial killer brother. Also, there is his relationship with his son. He genuinely seems to care for his child, and not merely as an extension of himself or out of a self-serving sense of narcissism. He wants the boy to have a good life and he even fears for the boy’s future, afraid that he will grow up to have his own “dark passenger.” One more major point comes to mind involving Dexter’s personality. He has a code. He has always considered this code to be more in the interest of self-preservation than any sort of true moral feelings. Harry taught him this code to help him survive, and to attempt to control the sociopathic tendencies he observed in Dexter after adopting him. But as evidenced in the very first episode of Dexter, he has somewhat internalized and personalized this code, and despite his protestations to the contrary, to me that is evidence that Dexter is not as heartless and conscienceless as he believes himself to be. As he prepares to dispatch his victim, another serial killer (he has been taught by Harry to hunt other bad guys, on the basis that they are not “innocent” and are therefore more deserving of death than another potential victim. Dexter (to his victim): Trust me, I definitely understand. See, I can’t help myself either. But children? I could never do that. Not like you. Never … ever … kids. The question of what “makes” a serial killer is complex and thought provoking. It is generally said that violent sociopaths emerge from a combination of personal social conditions, biological factors, and genetic factors, (Vronsky, 247.) In Dexter’s case, the witnessing of his mother’s brutal murder is a large factor. However, despite Harry’s best intentions, it may be argued that he is responsible for the social conditions which resulted in his evolution as a sociopath. After all, as a cop, Harry recognized the characteristics of a sociopath in Dexter at a young age, and rather than try to combat the “symptoms” of Dexter’s personality disorder by attempting to instill a sense of empathy and morality, he taught Dexter to just accept his “dark passenger,” and then gave him the tools to survive and essentially escape detection and punishment by the law. And yet still, some sense of humanity remains in Dexter. After all, if Dexter Morgan weren’t at least a little personable, a little “human,” he would not be relatable and the show would likely fail. Dexter: I’ve never had much use for the concept of Hell, but if Hell exists, I’m in it. The same images running through my head over and over. I was there. I saw my mother’s death. A buried memory forgotten all these years. It climbed inside me that day, and it’s been with me every since. My Dark Passenger. Harry taught me that death isn’t the end. It’s the beginning of a chain reaction that will catch you if you’re not careful. He taught me that none of us are who we appear to be on the outside. But we must maintain appearances to survive. But there was something Harry didn’t teach me. Something he didn’t know, couldn’t possibly know. The willful taking of life represents the ultimate disconnect from humanity. It leaves you an outsider, forever looking in, searching for company to keep. ++(Edit: 2015) It is interesting to note that when I was in school, I had a professor of Psychology who asserted that the terms essentially meant the same thing. Although the terms psychopath and sociopath are often used interchangeably, there also seems to be a general assertion by different sources that psychopaths are born, while sociopaths are made. This is, at its very base, a difference of nature vs. nurture. At any rate, it seems even many leading experts in the field of psychology and criminology can not agree on whether there is a meaningful difference between the two terms, or to which category the differences might be attributed. This entry was posted in Entertainment Corner, Expository/Essay, JustBlog Entries and tagged antisocial personality disorder, characteristics of a sociopath, Dexter, Dexter Morgan, killers, Peter Vronsky, psychology, psychopath, psychopathy checklist, serial murder, sociology, sociopath, television, true sociopath, TV. Bookmark the permalink. I can’t read this – I hate spoilers and only got to season two, though I have the rest. Hubby didn’t really like it, so he gave up. I watched some more when I didn’t have a job – but that was hard as jobless and watching box sets during the day is the epitome of lazy!